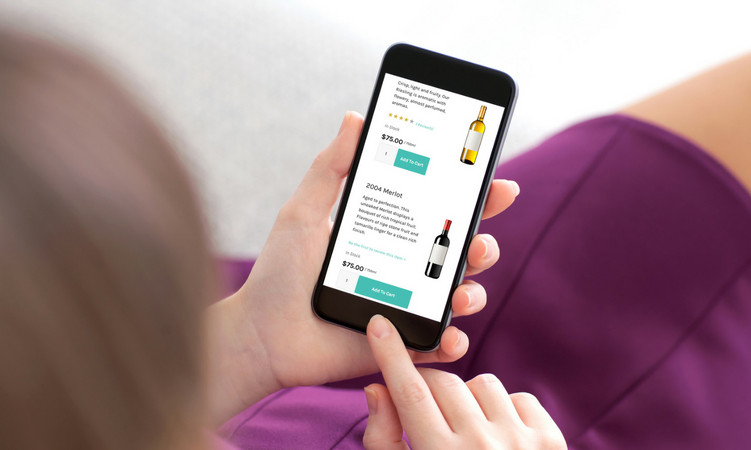 New research on the subscription ecommerce market from McKinsey & Company reveals trends and opportunities that offer insight into how to attract — and retain — your wine club members. The study sought to shed light on which factors motivate consumers to join — and also cancel — their ecommerce subscriptions. It also uncovered more about the demographics and purchasing behavior of subscription economy consumers. Acquisition and attrition are an age old challenge for wine club managers: this study offers fresh thinking on how to attract the right members and uncover what motivates them to stick with you! Here are our top 5 takeaways and how this research can help you drive sales and wine club growth. 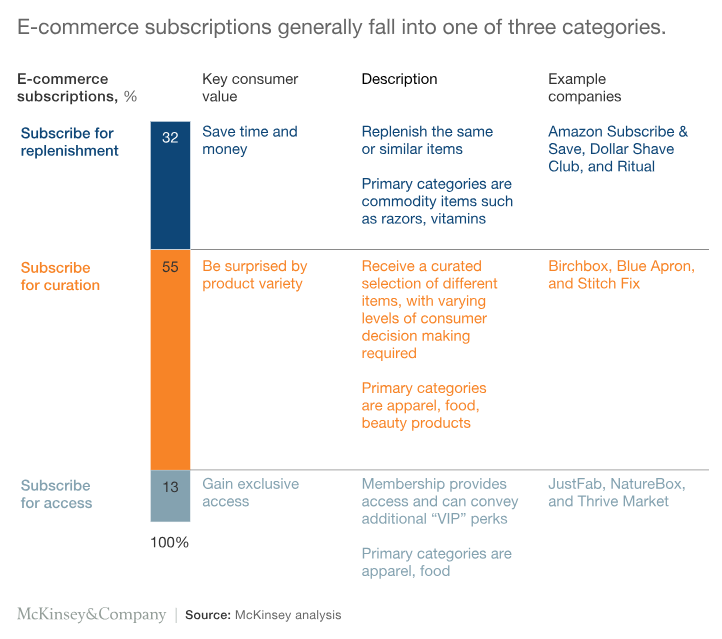 Ecommerce subscriptions typically satisfy one of three consumer desires: replenishment, curation or access. Replenishment saves time and money, curation offers surprise and delight and access implies exclusivity. The most popular type of subscription is curation-based, representing 55% of ecommerce subscriptions. This is excellent news for you, as it presents an opportunity for wineries to capitalize on the widely shared desire for variety. 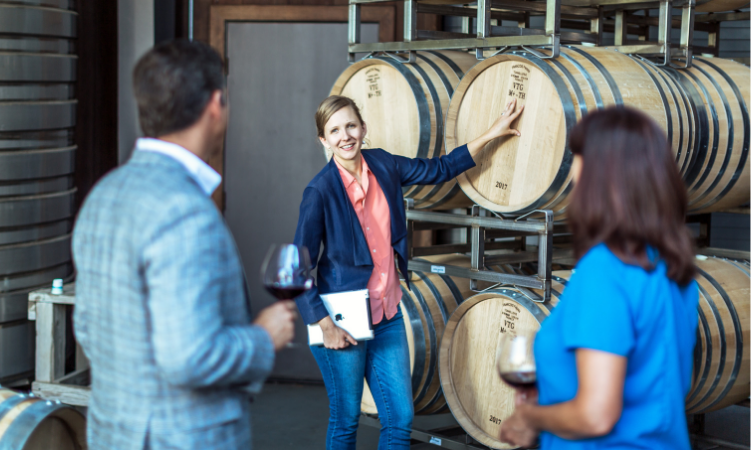 Whether this takes the form of custom wine clubs, comparative library verticals or even adding unique varietals to the mix — your winery can capitalize on the trend toward curation. Saving time and money is also valuable to consumers: 32% of ecommerce subscriptions are replenishment-based. Club memberships can save consumers time choosing wines, and often come with a better price tag. Lastly, 13% of ecommerce subscriptions are access-based. This is applicable for you if your winery offers limited production wines or has an allocation model. 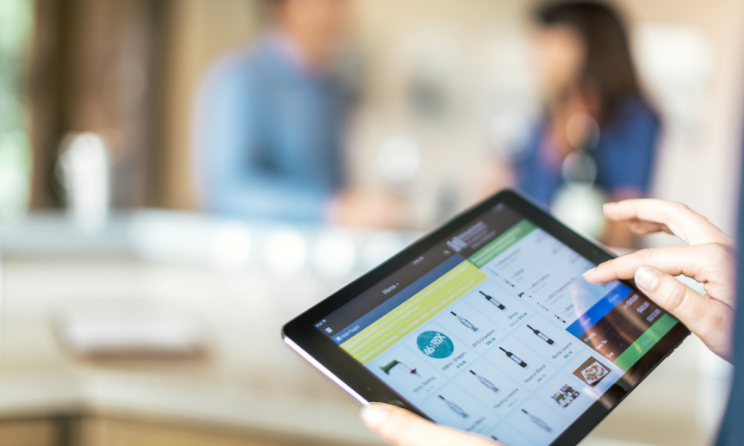 Regardless of which category your winery falls into, there is ample opportunity to increase your presence in the ecommerce subscription landscape. Wine quality should of course be front and center when presenting your product to consumers. Yet research suggests that it's not just what's in the box (or bottle) that counts, it's the overall experience surrounding a membership. In fact, 28% of both curation and access subscribers cite an excellent personalized experience as the single most important reason they continue their subscriptions. The value of a superb end-to-end experience is high. Every interaction that occurs with a customer from the moment you answer their call for a tasting reservation to the day they open your wine to share with friends, is a chance for you to win their admiration. 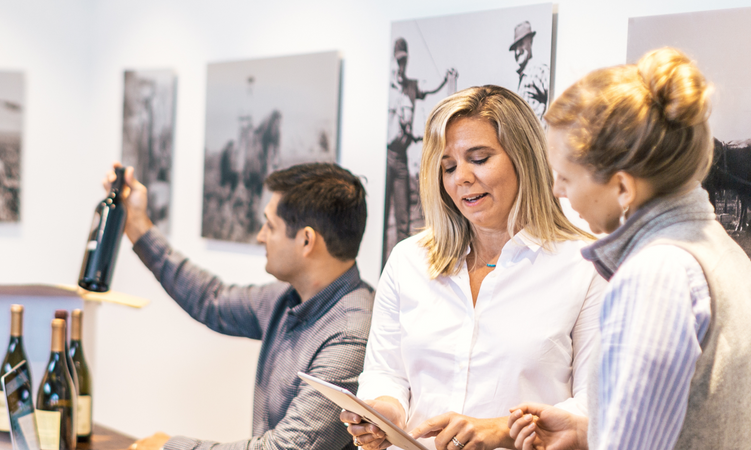 The experience you offer during their visit, the customer service you provide via phone and email and the condition in which they receive their wine shipment are just a few of many critical considerations. Falling short even one step of the way can result in losing members. That's why high-touch, personalized service is sometimes more important than your product itself. For tips on how to grow your wine club revenue in today's personalized online economy, check out our free eBook! 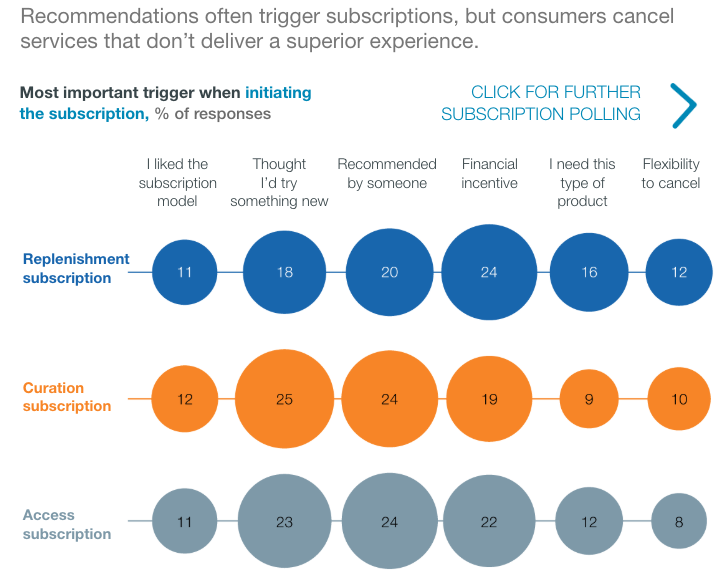 When asked about the main reasons for subscribing to a brand, recommendation was the only factor that ranked in the top two reasons across all types of subscribers: 24% of both curation and access subscribers, and 20% of replenishment subscribers, cited a word-of-mouth or online recommendation as a top decision-making factor. This finding again emphasizes the importance of offering a superb end-to-end experience. If customers have phenomenal things to say about your winery, they're likely to spread the love! So, if you have an extensive network of longtime and VIP clients, leveraging these customers as ambassadors of your brand is highly beneficial. Positive online reviews such as critics' wine accolades and consumers' travel reviews can also be used to your advantage. Reply to positive feedback publicly with words of appreciation, and address negative feedback promptly. View even the most unwarranted public complaints as an opportunity to show all your customers that their satisfaction is your priority. Not surprisingly, the ecommerce subscriber demographic is primarily comprised of consumers between 25 and 44 years old compared to the general U.S. population. They have incomes averaging between $50,000 and $100,000 and often live in urban environments, especially in the Northeastern part of the country. Women account for 60% of overall ecommerce subscriptions, but men are more likely than women to have three or more subscriptions — 42% versus 28%, respectively. We know from the 2018 DTC survey conducted by Silicon Valley Bank and Wine Business Monthly that Gen X consumers are likely to surpass baby boomers as the largest group of fine wine consumers around 2021, and that by 2026, millennials will assume this role. 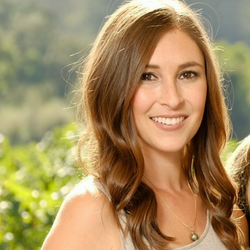 Keep these two cohorts top of mind as you build out your wine club offerings. Take a few tips from Outshinery on how to take your wine club to the next level. 5. Sweeten the Deal, But Not Too Much! The challenge of acquiring and retaining members isn't unique to wineries. Across all types of products and services, conversion rates are low and attrition is high. Only 55% of consumers who consider an ecommerce subscription will ultimately join. Of this percentage, almost 40% will cancel their subscriptions. This is consistent across replenishment, curation and access subscribers. What are you doing to increase your club conversion rate? Subsequently, how do you keep club members interested for the long haul? It takes a delicate balancing act to accomplish both goals. While extending deep discounts and peppering new members' inboxes with extra promotions up front can serve as a short term strategy, you'll want to have a plan for the long game. Otherwise, it can become increasingly difficult to cover your acquisition costs as churn perpetuates. Satisfying consumers' desire for customization is one avenue your winery might capitalize on in various forms. After all, according to another McKinsey & Company study, personalized communications are not only tied to lasting customer loyalty, but can drive revenue growth by 10% to 30%.